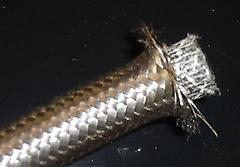 Hoses covered with stainless steel overbraiding can be a right pain in the fingers. When cutting these the braiding can unravel a bit making fitting them difficult, they look a mess and they are dangerously prickly. One way to cut these is to first wrap the area to be cut tightly in insulation tape, then use a sharp hacksaw or better still a thin cutting disc in an angle grinder to cut through the taped area. You will then be left with a neat, wrapped end on both pieces. Alternatively you can purchase a Stainless Steel Braided Hose Cutter. Summit Racing do them at a good price and shipping isn't expensive now they use the i-parcel service. Wen plumbing your power steering, should you choose to fit it, ensure any hoses and fittings on the pressure side of the rack are rated at 2,500psi. Power Steering pressures can easily hit 2,000psi when manoeuvring the car on full lock. When plumbed, ensure you test this on your driveway as you don't want the surprise of it failing while driving or at the IVA with the inspector under your car! Put the car in neutral, hold the steering on full lock and bring the engine revs up to around 5,000rpm or more, depending on the rev limit of your engine. Make sure everyone stands well back as hot power steering fluid at these pressures won't be fun. Rover fitted several different Lucas distributors during the life span of the Rover V8 engine, at least one type in my opinion is NOT suitable for any form of high performance engine. (I’m assuming that your engine is a least ‘nodding’ towards performance as you’re fitting it into a Cobra replica). Basically in my opinion any form of dizzy that has points fitted should be either upgraded to electronic switching or thrown into the bin! The OPUS electronic system also has a reputation for breaking down due to the constant heat cycles that it goes though. If your current setup is exactly how Rover intended then the engine will run OK but you will be losing a lot of low down torque and possibly even top end BHP. This is NOT because Rover did not know what they were doing; they did know exactly what they were doing! They set the ignition up very conservatively because during its life the engine may have to cope with all sorts of conditions that a normal person would not dream of putting an engine through. Things like low octane fuel, labouring in the wrong gear, wrong grade plugs glowing red hot due to carbon build up, etc, etc. Of course your current setup could be worse than the Rover setup in terms of the timing and the advance curve, in which case you will be losing even more power! You can buy timing tape but it is very easy to make it yourself, it might not look great but who cares! The tape can be made using narrow masking tape. Ideally it should have one mark at 20 degrees after top dead centre (ATDC) and should also have marks from TDC round to 40 degrees Before Top Dead Centre (BTDC) in 2 degree steps. On my standard Rover damper the gap between each 2 degree mark is 2.75mm. 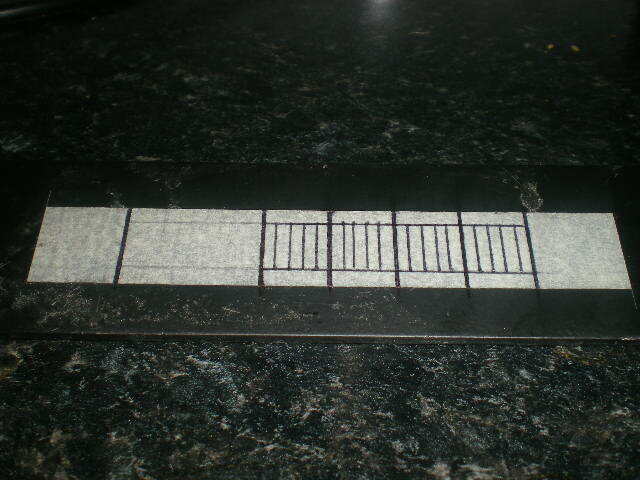 Do not mark the tape then repeatedly measure 2.75mm and make another mark, as this method will lead to cumulative error. All the marks should be a measurement from the TDC reference point. The actual measurements are listed below. Note that these measurements are for a 157.5mm (6.2 inch) diameter damper wheel. It is not going to be possible to be totally accurate when using a ruler for all of the marks but some of them do equate to easy to measure distances so that should help. Make the marks at 0, 10, 20, 30, and 40 degrees bigger than the marks in-between. (See image below). To dismantle the distributor you will need the normal selection of tools plus one or two that make the whole job a bit easier. 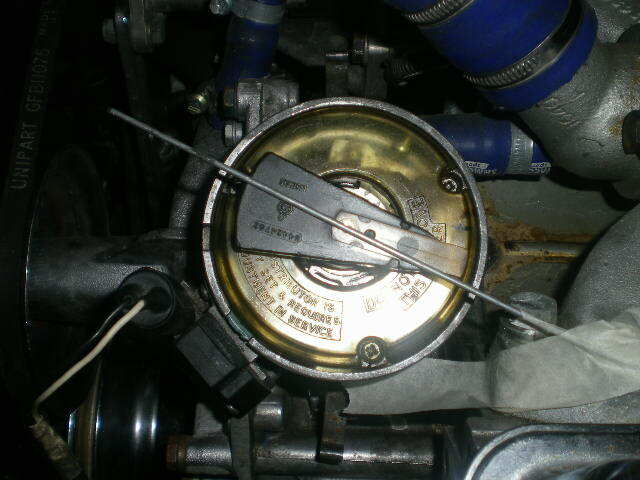 Other tools such as a timing gun are required in order to carry out the whole re-timing task. *A piston dead stop is required in order to find true TDC. 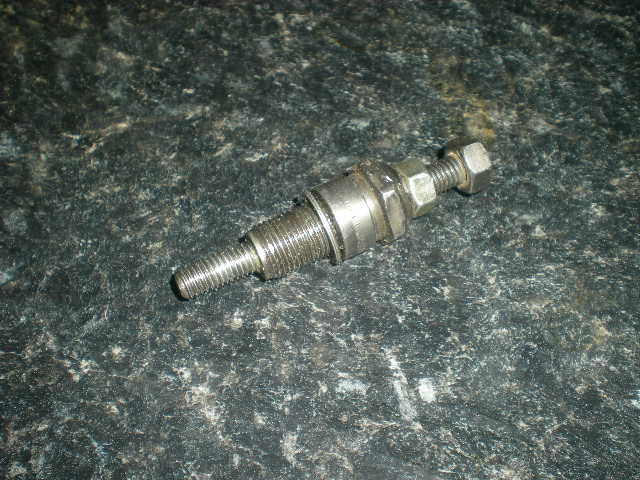 You can make one from a dismantled spark plug. The one in the picture below is adjustable which just makes the job slightly easier. 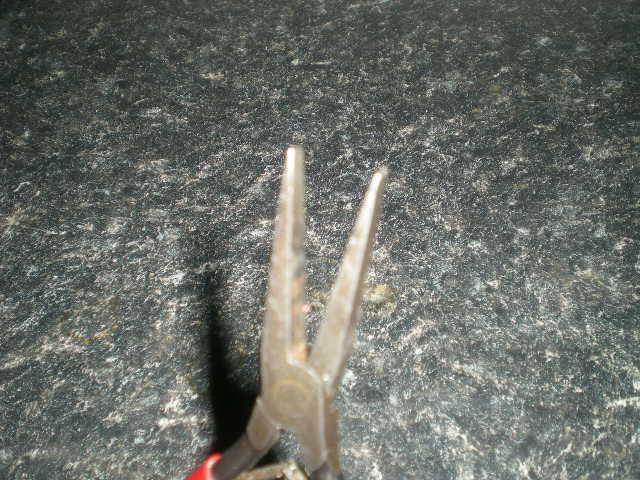 *External circlip pliers will be required for removing the clip that holds the trigger wheel in place. *Flat blade pliers are good for removing and fitting the bob weight springs, they allow you to hold the spring by one of it’s coils rather than by holding it by its end loops, this prevents you crushing the loops or risking stretching the spring. *Hopefully you won’t need a puller for removing the trigger wheel, it should just slide off the distributor shaft but as the trigger wheel is made from iron it can rust enough to cause it to stick to the shaft. You must be VERY careful with the trigger wheel, it is VERY brittle! The puller in the picture was only designed to be used once therefore the final leg of the puller was welded on whilst the puller was in place on the distributor. My Damper. Note that the timing marks were actually cut into the damper, the tape idea came later! The crank is just past 40 degrees in this image. 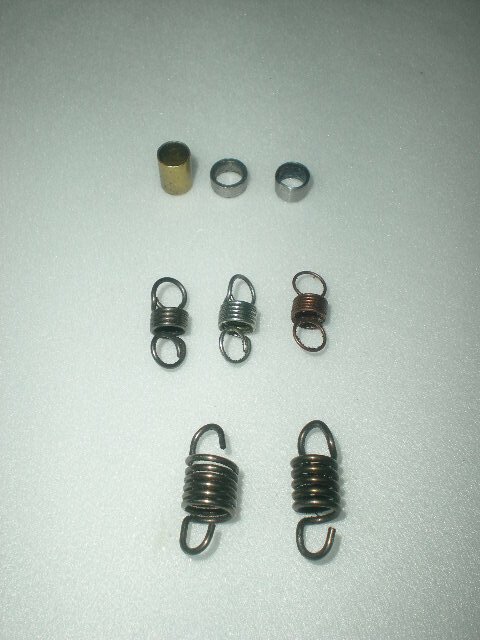 Real steel sell a spring kit that contains suitable springs. The kit is not actually designed to be used in a Rover engine so the bob weights and other components that come with the kit cannot be used. 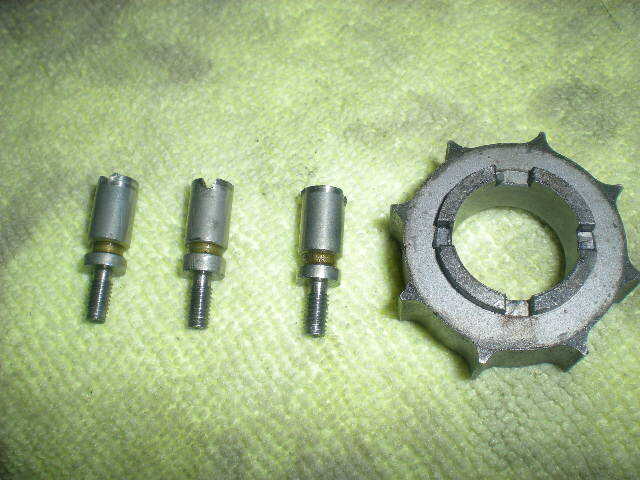 The kit contains a small copper sleeve that can be used to restrict the total mechanical advance. Personally I would not use it as the dimensions are wrong and copper is not really a suitable material as it is far too soft. Unless you are prepared to carry out some basic checks it really is not worth doing anything! The checks do take a while but are very important. *Remove all the spark plugs. *Jack ONE rear wheel into the air and slowly turn the rear round in the OPPOSITE direction of normal travel. All being well the piston should at some point hit the piston stop. If the dead stop is adjustable you can tweak it so that the 20 degrees ATDC mark on your tape is the one that is lined up with the pointer. *Now turn the rear wheel in the normal direction of travel, at some point the engine will lock up again. Hopefully it will lock up at 20 degrees BTDC, this would mean that the timing pointer is spot on. This is not very likely to happen so lets say the engine locked at 12 degrees. (This is easy to check as you now have your nice new timing tape fitted!). This would mean that the pointer is out by half of the difference. The difference being 8 degrees, and half of that being 4 degrees. *Without moving the engine (so it’s still against the piston stop) you need to move the pointer 4 degrees towards the 20 degrees mark. In other words the 16 degrees mark (12+4). The pointer is adjustable but it’s still quite a fiddle! *Now turn the rear wheel backwards until the engine locks again, keep adjusting the stopper so that the engine again locks at the lone 20 degree ATDC mark. *Turn the rear wheel in its normal direction until the engine locks, it should now be at the 20 degree BTDC mark. This must mean that the TDC mark really is at true TDC. You may have to repeat this process a few times but even if it takes you an hour or more you must get it right! The second check…See what the current timing is set to. Before you change anything we now need to find out what the timing is currently set to. You may think that you already know this but if someone had set it up whilst the timing pointer was not set correctly then the timing figures that they think that they’ve set up will wrong. *Make sure that the car is not in gear! *Fire the timing gun at the damper and read off what the static timing is when the engine is running at 1000 RPM (or less). *You can try to gradually rev the engine to see how quickly the bob weight advance kicks in. You can keep upping the revs to see whether you can get the mechanical advance all in. If it’s not all in by 3500 RPM I would not rev it any higher. The engine will probably be still too cold to be revved any harder and anyway you will have proved that the springs are too strong. *If you think that you can get the entire mechanical advance all in then make a note of the total advance. You will need a helper to operate the throttle and keep an eye on the rev counter. You will need some form of hand signalling system to indicate things like more revs, less revs, hold the revs. BE CAREFUL when running the engine with your head under the bonnet, things like the fan belt and alternator cooling fan are just waiting to do you some serious harm! You might also find that the static timing was between 6 and 8 degrees, this is more or less what a standard Rover setup would be. Note:- I have actually run my 4.6 engine with 32 degrees total advance and I noticed an improvement in the performance in the 3000-6000 RPM range. The total advance figure required must vary from one engine to another depending on the dynamic CR which in turn depends on the static CR, the camshaft, and the VE of the engine. The above figures will work very well but only with the vacuum advance system permanently disconnected. I have found that the pickup from going from no throttle to a small amount of throttle is very jerky if you leave the vac connected. Basically the combination of the vac and the fact that the bob weights are adding advance quite quickly is just too much for the engine, this is on top of the fact that the static timing has been increased which has the effect of advancing all the other settings. The result is that the engine kicks back. The kicking back is not good for the engine as it is basically the result of at least one piston trying to go back down its cylinder BEFORE it has reached TDC! Removing the vac system is quite controversial and goes against the grain with many people. I was one of those people for a long time, but on balance I can say that my engine and others that I’ve worked on do run better without it. The reason that the fuel consumption and overall performance is still better without the vac system is because the rest of the distributor has being re-calibrated. If you just removed the vac system and did not carry out any other modifications the results would be rather poor. It has been suggested that the ported take off point for the vacuum canister on the Edelbrock 500 creates too much vacuum and this can cause a problem as the canister will add its advance in too quickly due to the high vacuum. As a final note, I believe that JE Developments run all their engines without any vacuum advance system, that’s enough proof for me! Before removing the distributor remove the distributor cap, use the rear wheel to bump the engine round so that the pointer is at the position that the engine was firing at (Maybe 6 or 8 degrees). It’s best if the plugs are removed again or at least slackened off. Check that that rotor arm is pointing in the direction of where the number one HT post would be if the distributor cap were fitted. If it’s not then you will need to rotate the engine one full revolution before lining up the timing marks again. You can mark the engine in a suitable place that lines up with the rotor. 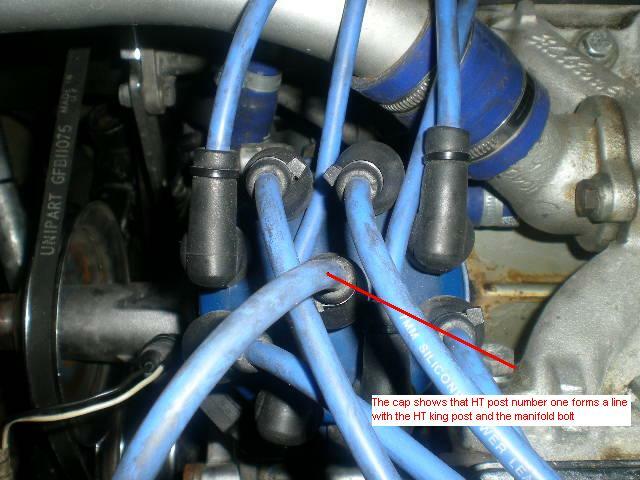 On my engine one of the inlet manifold bolts happens to be in just the right place! (see the image below). You can now mark the distributor and the block just where the distributor shaft enters the engine, use a felt tip pen, don’t make a permanent mark at this stage. You need a clean area you work in and a small pot to but all the ‘bits and bobs’ in. I actually hold the distributor in my vice with soft jaws fitted. 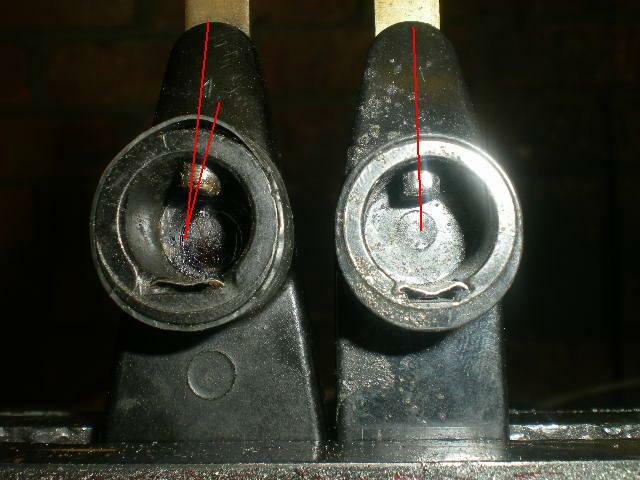 Clean off any filings that are stuck to your vice first! The amount that the distributor needs to be dismantled depends on the work that needs to be carried out. To dismantle the ‘top end’ first remove the rotor arm. Even this can be tricky, if the plastic clip that sits right under the rotor arm has broken the whole mechanical advance mechanism will start to lift up rather than the rotor sliding off its shaft. The advance mechanism will then fall to pieces and will possibly stretch the springs in the process! The way to check for this is to very carefully watch the trigger wheel, if it lifts up more than 1mm then use a screwdriver to hold it down. Now remove the circlip, use circlip pliers, don’t try to bodge the clip off because if you break it you will find that it is an odd size, it is therefore not easy to get a replacement. 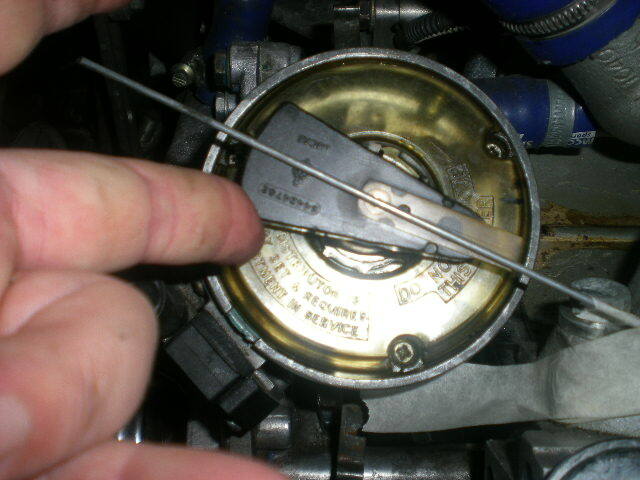 Remove the thin washer and the ‘O’ ring, you need to use a thin screwdriver to get the ‘O’ ring off. Now with any luck you can pull the trigger wheel off the shaft, again watch out for the whole mechanical advance mechanism lifting up with it. The trigger wheel can rust onto the shaft which is a real pain, it is also not easy to grab hold of. You must be very careful with the trigger wheel as it is very brittle! When working on one distributor I had to make a puller to get the wheel off, the whole shaft had to be removed from the distributor first in order to fit the puller. You can now remove the upper plate along with the pickup sensor; the sensor does not need to be removed from the plate. The three screws that hold it in place can get chewed up over a period of time, mine were so I spun them in my pillar drill against a file to flatten them off. (See the image below). Now you will get to see the state of the springs and bob weights. You need to replace the springs with one copper spring and one bright silver steel spring in order to get the mechanical advance all in at around 2700 RPM. I have heard that some distributors were produced with different sizes of weights so you will need to check the actual figure when the engine is running. You may then have to swap out the springs depending on the results. The image below shows how the total advance can either be increased or restricted. 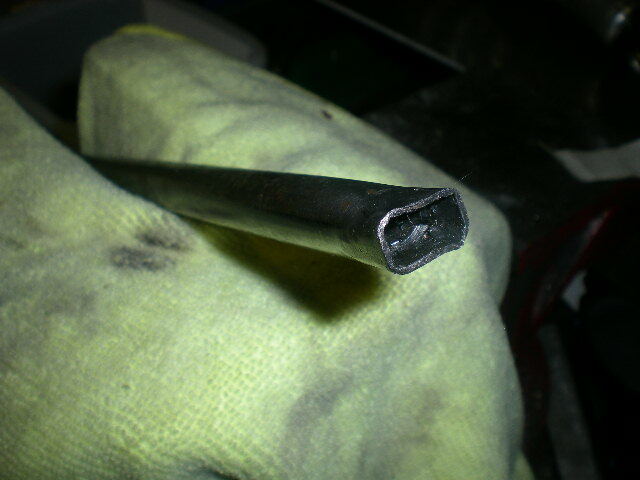 To restrict the advance you will have to make or get made some steel sleeves in various sizes to act as stoppers. The problem is that one of the bob weights can rub on the sleeve and will therefore lock up. It is not easy to file the clearance required, if this is a problem you will really need to remove the whole shaft to help gain access. (How to do this is described below). 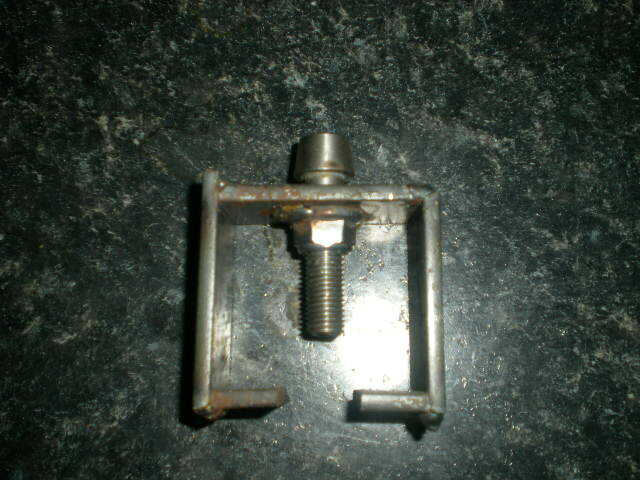 If your advance mechanism does ‘fall to pieces’ then this can actually help has it will be very easy to file the bob weight to create the required clearance. If you do dismantle the mechanism make a very careful note of the odd shaped spacer that sits between the lower base plate and the small rotor shaft. It needs to be refitted correctly otherwise the mechanism won’t work correctly. If you want to create more total advance then you need to file the area indicated in the picture below. This area has been hardened and tempered so it’s quite hard work to file it; I used a Dremel with a tungsten carbide burr. (Note that this area on my bob weights is no longer case hardened as it has been subjected to filing and then welding when I realized that I had filed far too much off!). There maybe a number stamped on your bob weights, this indicated the total advance that the mechanism can supply at the crankshaft. I would not believe this figure for reasons that will be explained later. I did try to work out how the changes to the distributor would effect the timing whilst my distributor was held in my vice. This involved working the mechanism whilst a 360 degree protractor was attached to the shaft where the rotor arm is fitted. A pointer was setup to help with the test. The figures that the test produced did not translate to the real world when the engine was run. The possible reasons are explained later. Note that any degrees measurement that is obtained from this test needs to be doubled to convert the figure into crankshaft degrees. In order to remove the whole distributor shaft from the body you need to knock out the roll pin that goes through the drive gear. Use a punch that is a similar diameter to the pin. Support the gear by clamping it between two bits of soft wood in a vice. One of the issues that can affect the distributor is end float of the shaft, this can be shimmed out with a suitable sized washer that is slipped over the shaft before the drive gear is re-fitted. The end float on my distributor is 10 thou of an inch. There must be some clearance to allow for expansion and to allow oil to travel up the shaft. (See image below). Note that if the shaft is removed there is a nylon spacer that sits between the lower base plate and the distributor body. Make sure that you clean off all the swarf before re-building the distributor, if you removed the main shaft apply some engine oil to it before re-fitting it. Before re-fitting the base plate you need to decide whether you are going to leave the vacuum canister in place of not. If you do leave it in place then make sure that the peg in the upper pickup plate is located in the hole in the canister arm to stop the upper plate and pickup from moving about. I removed my canister and locked the plate in place with a strip of steel. (See the image below). The plate is locked in the in the same position that canister holds the plate when there was no vacuum applied to the canister. The locking bolts and steel strip only just fit without fouling the distributor body so be sure to check this if you decide to follow my method. When fitting the upper base plate, (the one with the pickup fitted) try to get it to sit centrally over the shaft that protrudes through the middle of it. Re-fit the trigger wheel and note that it will only lock into place in one position. You can now check the gap between one of the spikes on it and the pickup. The actual gap is not critical, a large gap just means that the spike will get have to get slightly more in-line with the pickup before it is sensed by the pickup. You won’t want the gap to be so small that there is a possibility of contact. Equally you don't want the gap to be so large that the pickup can not sense the spikes. Mine is set to 25 thou of an inch. Fit the clear plastic cap and note that it will only fit in one position. The temporary mark that you made on the distributor body can now be made more permanent by the use of a junior hacksaw blade, clean off any swarf. Do not make a permanent mark on the engine yet. (See the image below). 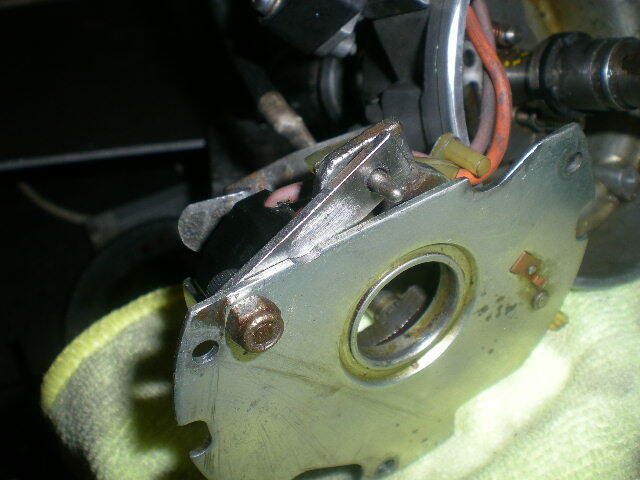 If your bob weight mechanism does fall apart you might want to fix it. The danger of not fixing it is that you might at some point in the future try to pull the rotor arm of and end up with the mechanism falling apart and the springs being stretched. The distributor can now be re-fitted back into the engine, this can be a bit of a fiddle, the oil pump has a habit of ‘creeping’ round so you might have to re-set its position using the priming tool. 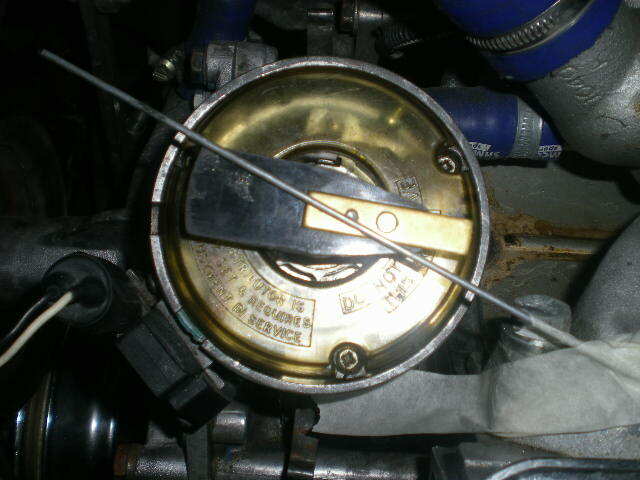 The distributor needs to be fitted so that the new permanent mark lines up with the temporary mark on the engine. 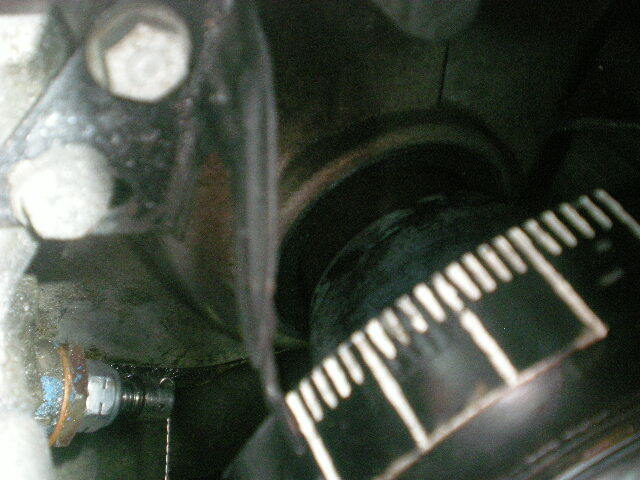 The rotor needs to be pointing at the mark that you made that lines up with it before you removed the distributor. Due to the action of the skew gears you have to misalign the mark as you are lowering the distributor into its hole. 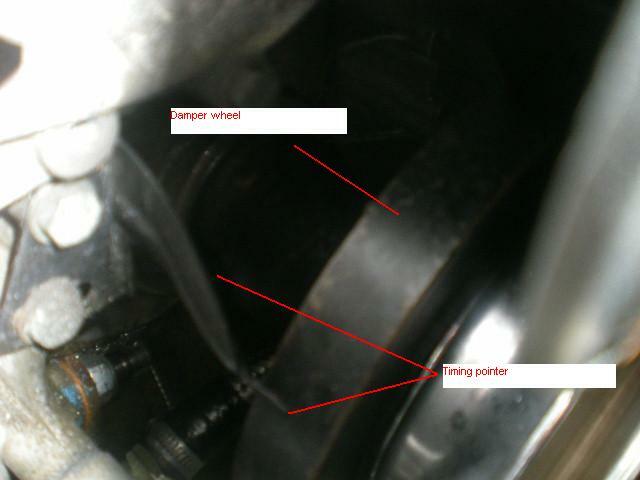 You can see in the image below that my rotor arm is pointing to the manifold bolt; in my case the engine is at 12 degrees BTDC. 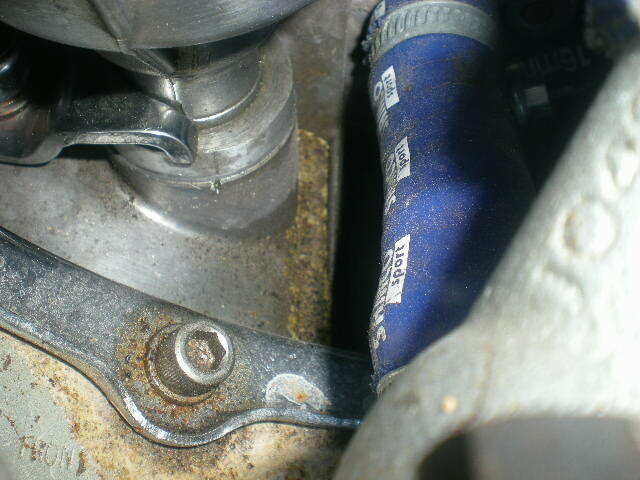 Fit the distributor cap and pinch up the clamp bolt so that the distributor can be turned with some effort. 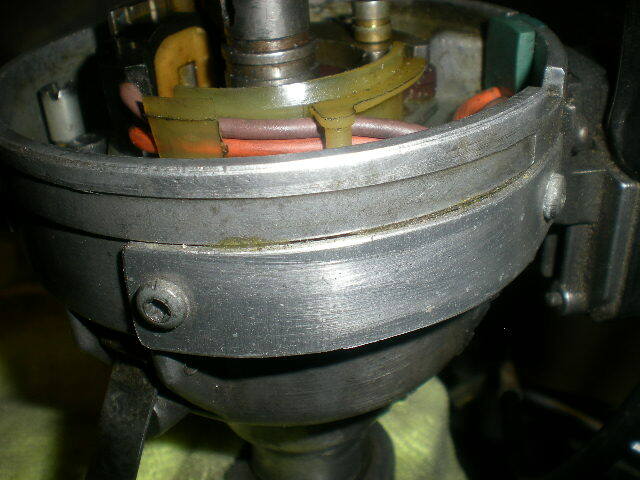 Re-fit all the spark plugs and leads, block up the vacuum port in the carb, the port in the canister can be left open. Connect up the timing gun, make sure that the car is out of gear then fire up the engine. 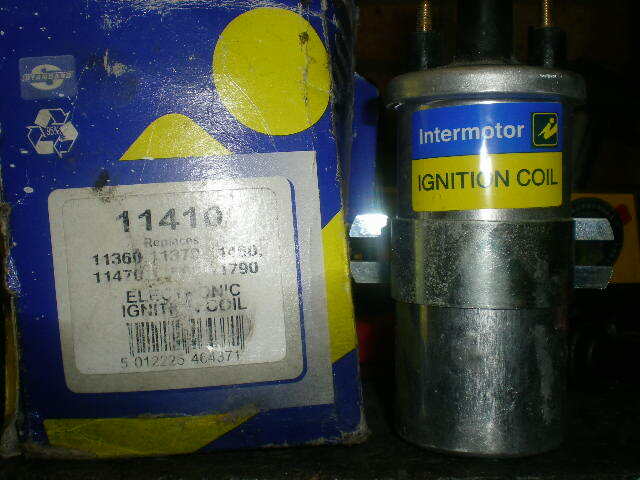 If it does not fire then try advancing or retarding the ignition by turning the distributor 5-10mm at the most. Turning it anti clockwise advances the ignition. Once the engine has fired up and is ticking over you can check the timing, adjust the distributor to obtain the static figures given above. 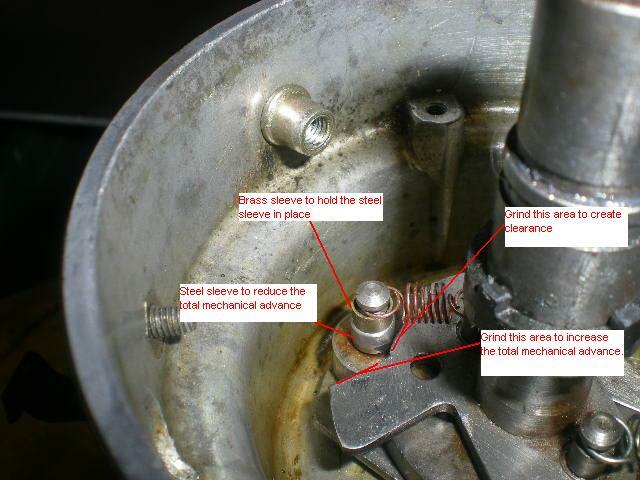 You need to fully tighten up the clamp bolt, I have notice that is can cause the ignition to retard 2 or more degrees, if this happens you will have to add 2 degrees to the required figure before the bolt is fully tightened. You might find that the tickover speed increases so this will have to be adjusted back down once the engine is fully warmed up. Once the static timing has been set up you can use a thin screwdriver that fits in the junior hacksaw slot that you made to extend the timing mark onto the actual engine. This will help if, or when you remove the distributor in the future. (See the image below). Note that I have never managed to remove and re-fit the distributor whilst getting the timing ‘spot on’ no matter how accurately I align the marks. You will always need to re-time the engine with a timing gun. You now need to check the total advance and the RPM that is required to obtain it. You will need a helper for this. Use the hand signalling method to get your helper to gradually increase the RPM, at some point no more advance will be given by the bob weights, you need to note the total advance and your helper needs to note the RPM. It may take a few attempts to get both the RPM and the total advance figures. If the figures to not compare to the ones given above unfortunately you will have to dismantle the distributor and make the necessary changes. I noticed on at least two 3.5 engines that the ignition seems to retard 2-4 degrees just as the revs rise up to around 1200 RPM, initially I thought that this was due to camshaft walk or the distributor shaft rising up due to the load on the bevel gears. However, my 4.6 engine also displays the initial retardation and that has a camshaft retaining plate to eliminate walk. My distributor also has had most of the end float shimmed out of it so I really don’t know what causes the phenomena. 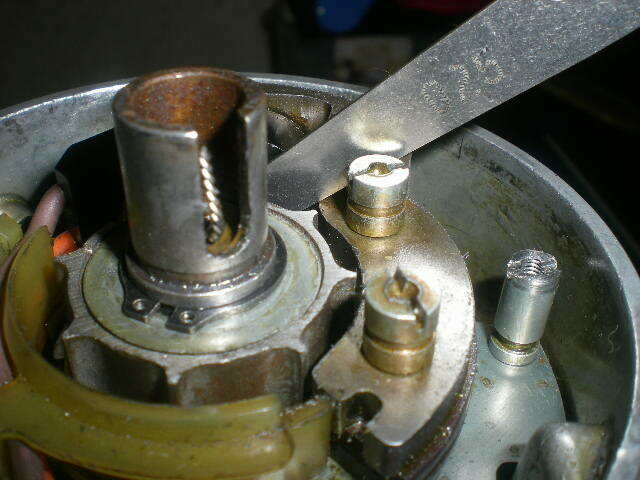 I think that this is the reason that measuring the mechanical advance using a protractor when the distributor in held in a vice fails to produce the same results as measuring the advance by running the engine with a timing gun. I have read a couple of tuning books that mention the issue of rotor arm mis-alignment so I decided to check this out on my distributor. The results were not good! The problem is that the rotor arm is quite often not directly under the HT post when the trigger wheel and pickup decide to fire a plug. Hopefully the nearest post is connected to the spark plug that is required to fire but really we don’t want to be relying on hope! You can check for the problem by bumping the engine round on the rear wheel until the pointer and timing tape line up at your static timing figure. On my engine this is 12 degrees BTDC. 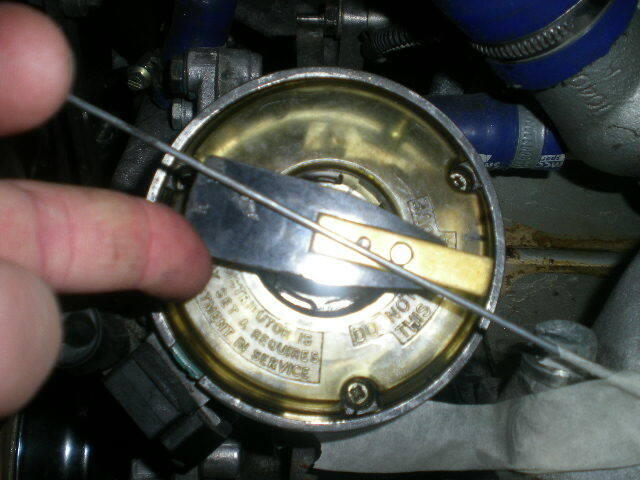 You then need to work out where the HT post for number one cylinder would be when the HT cap is removed. (Refer to the image titled “HT Post number one lines up with manifold bolt” above). 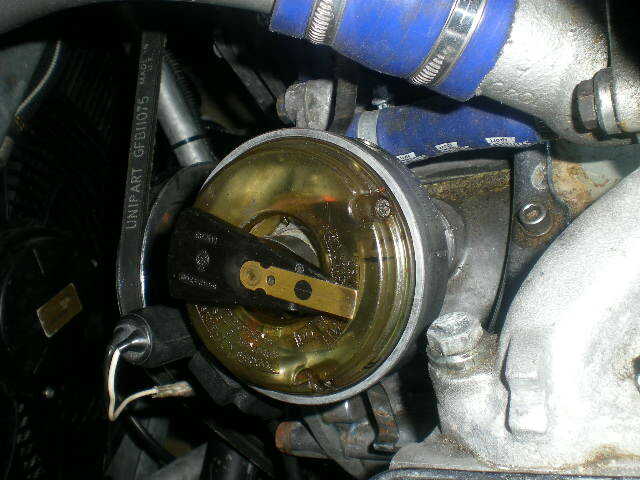 Remove the distributor cap, the rotor will either be near the HT post or 180 degrees away, if it is then turn the engine over on full revolution and set the crank to the firing point again. The image below shows a standard rotor at the same 12 degrees, you can see that the tip of the rotor arm is a fair way away from the coat hanger wire! Again the test is carried out with a standard rotor. It could be argued that the mis-alingment has been be designed into the distributor to allow for the fact that the rotor is turning at 3000 RPM when the engine is more or less at peak revs but I personally don’t think that this is the case. The reason is that electronic switching is capable of occurring so fast that 3000 RPM is barely enough to trouble even a basic switching transistor. In fact as the engine has 8 cylinders there are 8 switches within one revolution of the distributor. So that’s 400Hz or 400 switches per second. Considering that computers are now operating at GHz speeds, 400Hz is nothing! 400 switches per second for a set of points is a different matter! (I believe that with a dual points setup the figures would still apply as one set of points collapses the LT to initiate the HT spark, the other set of points is to build up the LT in the primary side of the coil. 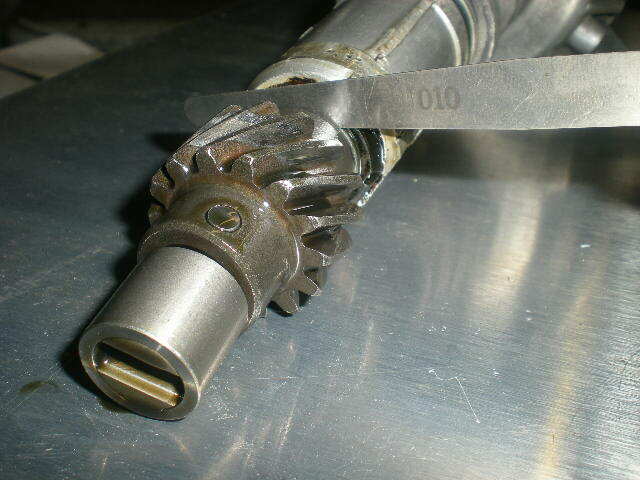 I don’t think that the issue can be resolved by moving the distributor’s drive gears round by one or more teeth as the problem is all contained within the distributor. It is the relationship between the rotor arm position, the trigger wheel and pickup, and the distributor cap that can cause the problem. The image below attempts to show the modification but due to the camera angle it is not that clear. I have also experienced an insulation breakdown of a rotor, I feel that this was due to it being a cheap rotor compounded with rotor mis-alignment. 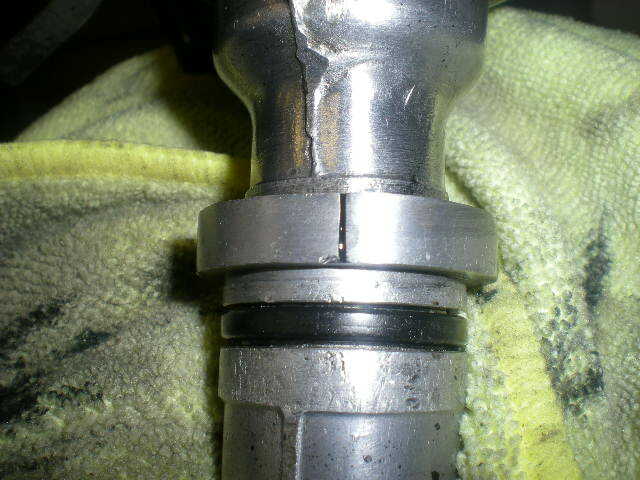 The rotor was OK for about 50 miles before the engine just ground to a halt. It also seems that once a rotor has broken down in this way it is permanently damaged and is only good for the bin. Jim Robinson of JRV8 is aware of the issue and when I last spoke to him he was trying to source high quality rotors. (He did NOT supply the cheap one that went faulty!). Wiring up the distributor if you are replacing a Lucas points distributor. I have been informed that the points coil can not be used with an electronic system therefore it will have to be replaced. There are many 'posh' coils available but if you just want a cheap no thrills one then the intermotor one in the image below should work. 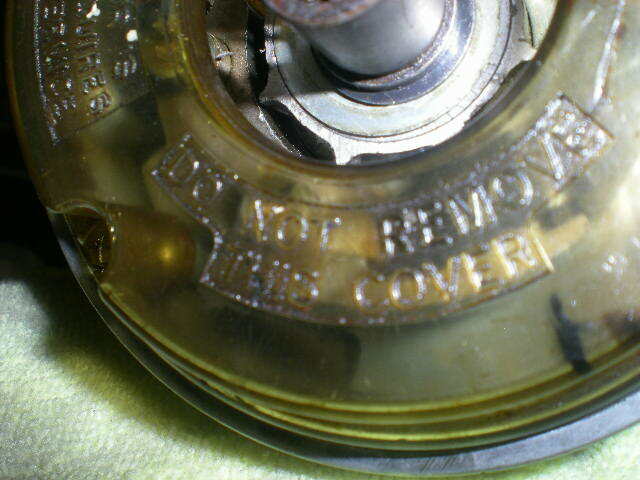 You can improve the look of the intermotor coil by removing the sticker on the side! The wiring for the system that uses an amplifer on the side of the coil is very easy to work out. 12 volts needs to be supplied to the coil's positive terminal. A spur from this terminal then goes to the amplifer (See the image below). The other side of the coil goes to the other terminal on the amplifer. This is also the terminal that would be used to trigger the rev-counter. Some of the newer amplifers have three terminals, I believe that the other terminal is for an earthed screen that goes round the cables that lead to the coil. Note that the system should not be run with a ballast resistor.